Set in the heart of Santa Monica, this all-suite hotel is just steps from Santa Monica Pier. The hotel is within easy reach of Hollywood and the glamour of Rodeo Drive. 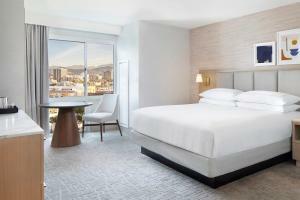 Unwind in comfortable 2-room suites, featuring a sofa sleeper, HDTV and views of beautiful Santa Monica. Relax by the pool or work out in the fully-equipped fitness center. Located about 9 miles from Los Angeles International Airport.